As fellow Diplomat blogger Zach Keck wrote yesterday, the dispute between China and the Philippines over the Second Thomas Shoal, known in the Philippines as Ayungin Shoal and in China as Ren’ai Reef, is heating up. A Philippine transport ship has been grounded on the shoal since 1999, with Filipino troops stationed aboard as a sign of Philippine control of disputed territory. On Sunday, China for the first time blocked civilian vessels that were headed to Second Thomas Shoal on a resupply run. China says the ships represent an illegal attempt to build on the reef; the Philippines insists the ships were stocked with food and water as a “humanitarian mission” to resupply the soldiers on the grounded vessel. The diplomatic row over the cargo and intentions of the Philippine ships may be just beginning. According to Reuters, a “senior military official” from the Philippines has said that Manila plans to send another round of civilian ships to the disputed reef. The China-Philippine dispute is just the latest example of the way third parties influence U.S.-China relations—usually for the worse. China and the U.S. are engaged in a long-term strategic battle for influence in the Asia-Pacific region. China, with its growing economic, diplomatic, and military might, expects to be the top dog in its own backyard, while the U.S. does not want to vacate its role as the dominant presence (Washington would say guarantor of stability) in the region. Yet this sort of long-term strategic battle is generally kept on a low boil, with little threat of tensions actually spilling over. In the short term, U.S.-China relations are generally shaken not by intrinsic differences between Washington and Beijing, but by disagreements involving third parties. The example of the Philippines is one typical such case. 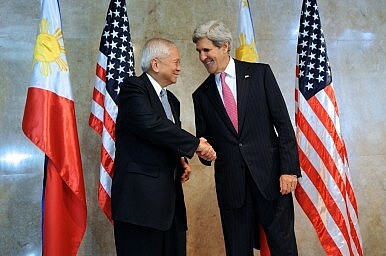 As the Philippines is a U.S. ally, Washington (despite its officially neutral stance on the dispute itself) has repeatedly voiced concern over Chinese actions that deny Philippine access to disputed territories. The China-Philippines disputes are flashpoints where the long-term U.S.-China strategic competition erupts into present-day friction. As such, the decisions and comments of Philippine officials have an outsized impact on U.S.-China relations, forcing both Beijing and Washington to respond (and placing them on opposing sides). Japan is another such “x-factor,” where a third party’s actions have serious consequences for U.S.-China relations. Indeed, although China-Japan tensions have received less attention lately, the disputes over territory and historical memory have even more serious consequences for U.S.-China relations. The U.S. has gone on record as saying that the Senkaku Islands (called Diaoyu in China) fall under the purview of the U.S.-Japan Mutual Defense Treaty—meaning that, should conflict break out over the islands, the U.S. would be obligated to assist Japan. As such, escalatory moves by Japan could have serious consequences for the U.S.-China relationship. Japanese Prime Minister Shinzo Abe’s visit to the Yasukuni Shrine last December, as well as inflammatory comments about wartime history from Japanese officials, have contributed to the rapid decline in China-Japan relations, with a corresponding dip in U.S.-China ties. On the flip side, one of China’s friends is also well-known for stirring up tensions in the region, including between the U.S. and China. North Korea’s provocations, from its recent missile launches to last year’s nuclear test, generally wind up pitting Washington against Beijing, as American officials press for stronger rebukes than China is willing to give. North Korea is an especially dangerous third-party actor, as its government decisions are often unpredictable. Exacerbating all the third-party tensions is the expectation that both the U.S. and China can and should do a better job of “controlling” their allies. Many Chinese officials believe that the U.S. could force the Philippines and Japan to stop their “provocations.” Some in Beijing even take this a step further and think that each move by Manila and Tokyo is actually part of an overarching U.S. plot to contain China, as though the Philippines and Japan were merely puppet regimes of the U.S. Meanwhile, the U.S. consistently argues that China can do more to rein in North Korea’s provocations, and takes each North Korean missile or nuclear test as a sign that Beijing does not actually want to work with Washington on the Korean peninsula nuclear issue. Despite these arguments, the other countries in the region are autonomous actors. Yes, they can be subjected to diplomatic pressure, but only to a certain extent—ultimately, leaders in Manila, Tokyo, and Pyongyang are first and foremost concerned with their respective countries’ interests. They will act according to their own best judgment, whether Beijing and Washington like it or not. And that makes these nations the “x-factors” in U.S.-China relations, and in East Asia in general.